By now this Perpignan band is less of a shadowy illusion and more of a full-on force of French underground sounds, and we couldn’t be happier to being a part in helping perpetuate this fully-blossoming evolution. HoZac had the honor of releasing the debut single from Les Liminanas in early 2010, featuring their most enduring song “I’m Dead” as well as their Crystal Anis LP a few years after, and in a short amount of time, they’ve laid the foundation of darkness delicately into their hazy template of swirling, mind-expanding soliloquies for all to see, hear, and feel. As time has passed, the band has expanded and contracted with whatever size ensemble worked best at the time, still rotating around the core members Marie & Lio but switching out lead vocalists and backup members until they found the right fit. Their newest incarnation features the duo with a full band, much like you’d see onstage when they play live, keeping those delicate nuances in top form, and allowing Marie & Lio to steer this vessel straight into your pleasure zones. On their new LP ‘Malamore’ they keep their lyrics mostly in English, yet their sly use of the French dialect is pure heaven to any fans of Serge Gainsbourg who also enjoy their side of Velvet Underground, and it’s a deadly combo to the uninitiated, to say the least. The breathy vocals inflected over the sublime feedback and fuzz coalesce into the perfect soundtrack to this utopian atmosphere, never quite reaching out fully from beyond their ethereal mist, yet grasping you firmly and pulling you into their lair where the senses are blurred into a living, breathing, embodiment of modern French noir perfection. And as if their own creative construction wasn’t already sturdy enough this time around, Peter Hook (Joy Division/New Order/Warsaw/Stiff Kittens) has even stepped up to offer his bass contribution on the track “Garden of Love,” which shimmers with other-worldly undulations and lifts the band even higher in reverence, a remarkable collaboration and a certain breakthrough, undoubtedly. 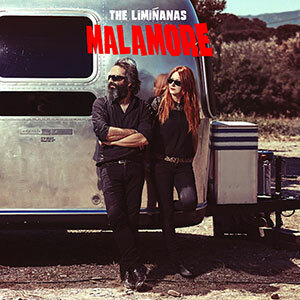 Your time to indulge has come, and The Liminanas have really struck gold yet again with ‘Malamore’ their latest high water mark in effortless French pop perfection, served cold, dark, and fresh. Ah, the never-ending charm of the French. We’ve been obsessed for years now, and this debut single from The Limiñanas has the power to unite warring nations and to seduce the innocent, all in one luxurious punch. 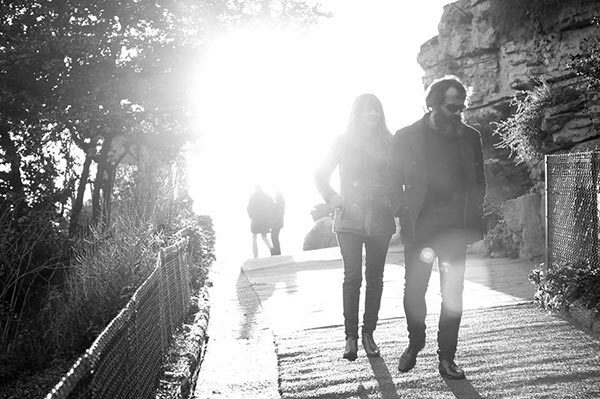 With grandiose production and simple, melodic hooks that would make Phil Spector blush in his jail uniform, The Limiñanas have that special something that embeds their harmonious arrival quickly into your brain, sending a sinister vibe through the original ye-ye formula and coming out with remarkable results. They cleverly avoid the typical trappings of the pedestrian revivalists and break through here with two incredible, haunting, and inspirationally grim sides that meld a heavy VU-drenched backbone to lurid pop splashes, that result in these timeless recordings you will no doubt cherish. Epic hooks like these combined with bashful female vocals dancing menacingly around the macabre, all done with that irreplaceable accent and performed in the raw like this are hard to come by, so dive into the swirling pop daydream conjured here by The Limiñanas, and you’ll find it hard to remember what life was like before it seductively invaded your world. And here it is folks, the sophomore LP outing from the French breakthrough underground sensations, The Limiñanas, who are embarking on an even darker journey on this voyage into the stickiest, most vulnerable parts of your brain. After triumphantly completing their maiden US tour last year and proving to the world how effortlessly they capture their recorded essence in a live setting, they have returned with Crystal Anis, an LP brimming with perfect, humming, fuzz-filled effervescent pop so alluring and seductive in it’s most intimate points that it’s easy to get lost as the heavenly sounds rush over your soul. It’s a perfect slice of modern French Ye-Ye gone underground, conjuring a dimly-lit atmosphere where the long lost transcendent sounds of The Factory intersperse with modern noir nuances to unbelievable effect. This is the Limiñanas hitting their compositional peak stride, with lush instrumentation, building on their signature thick-accented tension, all properly enveloped within their monumentally textured songwriting style. ‘Heavenly’ doesn’t even begin to describe it, but it’s a great place to start.